In the article titled ‘EPA Proposes To Ban Chlorpyrifos’, (Growing Produce; posted by Christina Herrick), EPA had been requested to respond to a petition identifying Chlorpyrifos levels found in drinking water by April 15th, 2015. This concern was raised from a petition submitted by the Natural Resources Defense Council (NRDC) and Pesticide Action Network North America (PANNA). Instead of submitting a ruling, EPA proposed a timeline to allow for additional data analysis to best understand the concern. As EPA was unable to make a safety finding as required under the Federal Food, Drug, and Cosmetic Act (FFDCA), and requested a timeline extension to acquire additional data, the 9th Circuit rejected EPA’s timeline and ordered EPA to either deny the petition, issue a proposed revocation, or issue a final revocation rule by Oct. 31, 2015. Issuing a proposed revocation provides an opportunity for public input prior to any final decision. The court also required EPA to provide the timeline for a final rule should EPA issue a proposed revocation by Oct. 31. EPA is notifying the court of the anticipated release of the final rule in December 2016,” the agency said. Admittedly EPA stated that there are “not risks from exposure to chlorpyrifos in food”….”But, when those exposures are combined with estimated exposure from drinking water in certain watersheds, EPA cannot conclude that the risk from aggregate exposure meets the Federal Food, Drug, and Cosmetic Act (FFDCA) safety standard. EPA has determined that safe levels of chlorpyrifos may be exceeded in parts of the U.S. for people whose drinking water is derived from some small vulnerable watersheds where chlorpyrifos is heavily used. If the tolerances are revoked, EPA would cancel the associated food uses of chlorpyrifos,” the agency said. Although the situation is far from resolved, if the revocation stands, where does that leave the tree fruit industry with regards to trunk borer management?? From my observations in the field this season, the borer complex has become a major threat to the tree fruit industry. 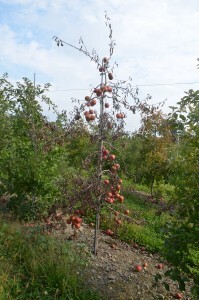 Recent tree decline leading to the loss of hundreds of apple trees in Hudson Valley orchards, all on M.9 rootstock in tall spindle planting systems, point to stress induced by dogwood borer (DWB) Synanthedon scitula (Harris), American plum borer (APB), Euzophera semifuneralis (Walker), and infestations of ambrosia beetle, the black stem borer (BSB), Xylosandrus germanus. When coupled with drought stress this season, these pests appear to be the primary causal agents of severe tree fruit decline and death in NY. In very few incidences have we found surveyed trees to have succumbed to decline from drought stress alone. Over the past 40 years, the use of a Lorsban directed trunk applications, using a high pressure, dilute and course sprays, effectively control the larva of DWB infesting rooting initials. Recent work conduced by Art Agnello provides data on alternative insecticide active ingredients, suggesting effective control of DWB using Assail 30SG and Rynaxypyr WG (APPLE EVALUATION OF VARIOUS TRUNK SPRAYS TO CONTROL BORERS INFESTING BURRKNOTS, 2006: Agnello & Kain). 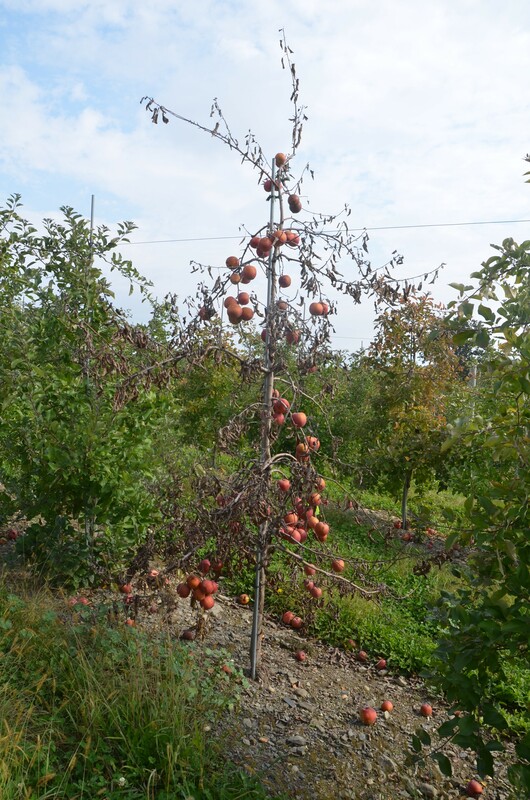 From early results in managing the BSB (Breth; 2014), Lorsban has also provided the most effective level of control to reduce infestation and re-infestation from this pest in young apple on dwarfing rootstock. Alternative options for management of DWB would include mating disruption in blocks of 5 acres or more. Isomate product for mating disruption of dogwood borer on apple is now labeled and available. The manufacturer is CBC (America) Corp. Work conducted by Dave Kain and Art Agnello using this product in field trials has shown this approach to be a viable approach to DWB management. In orchards where there are active infestations, one or more directed applications will need to be made during the first season using mating disruption to bring borer larva under control. As Assail 30SG is presently labeled for DWB management in trunk applications, it would work as a Lorsban replacement based on EPA ruling on Lorsban food tolerance and labeling status. “Estimated costs of applying chlorpyrifos (Lorsban 4E) based on a plant density of 800 trees per acre, $8 per hour for labor and a price of $30 per gallon for Lorsban 4E, at approximately $25 per acre . Treatment with Isomate-DWB dispensers at a rate of 150 per acre the first season, followed by 100 per acre thereafter, using the same labor rate, costs approximately $63.60 per acre for the first season and $42.40 per acre in subsequent seasons. Assuming that the efficacy of Isomate-DWB is equal or superior to that of Isomate-LPTB, then the ease with which pheromone dispensers are applied, the fact that no special equipment is needed and, presumably, the improved worker safety, may make the use of this product an attractive alternative for some growers”(Kain & Agnello).